I love pickles and quick pickles are so good because you can whip them up with very little effort and you know exactly what’s in them. This pickle makes an excellent side to all coconut based curries, it’s great on sandwiches of all kinds and I’ve also used it in Vietnamese Banh Mi style rolls to good effect. A few months ago a bought some organic rapadura sugar on impulse and I really love it. Rapadura is an unrefined cane sugar, high in essential minerals and iron. It’s still an added sugar, so it’s not something you should be eating large quantities like a vitamin pill but it is quite high in iron. A teaspoon of rapadura contains 2 milligrams of iron which is about 11 percent of the recommended iron in an average diet. Rapadura has a beautiful caramel flavor and I’ve started using it as a replacement for palm sugar and jaggery in cooking. When I was in Melbourne recently I was in a hipster coffee shop and they had rapadura sugar in their sugar bowls, so I came back inspired to fill my sugar bowl with rapadura but I’m waiting for the white sugar to run out which seems to take a long time in our house. (Nobody seems to take sugar in their tea and coffee any more) I haven’t used in much in baking yet but I’d like to substitute it for brown sugar and see how it goes. I’m particularly keen to try these chewy brown sugar cookies with rapadura because I reckon they might be completely awesome. 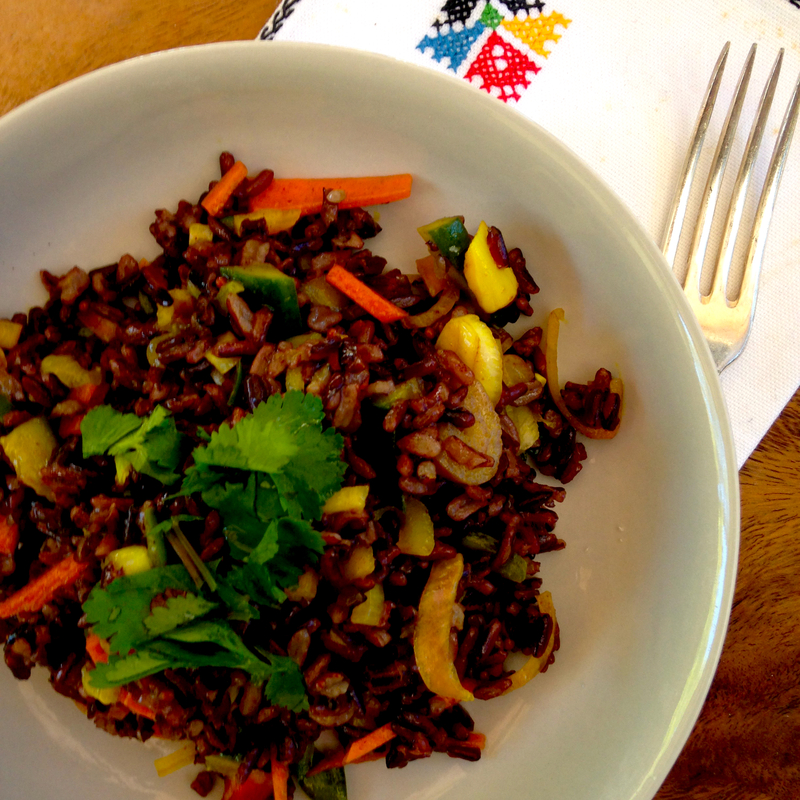 This pickle is also excellent, chopped up and added to leftover black rice for a quick rice salad lunch. Peel carrot and cut into thin matchsticks. Slice red capsicum into thin slices. Slice cucumber in half lengthwise , scoop out seeds and slice into batons. Cut green chilli into half, de-seed and slice finely. Slice shallots. Mix all vegetables in a medium bowl. Mix remain ingredients in a small saucepan, bring to the boil and stir until sugar is dissolved. Remove from heat and pour marinade over vegetables. 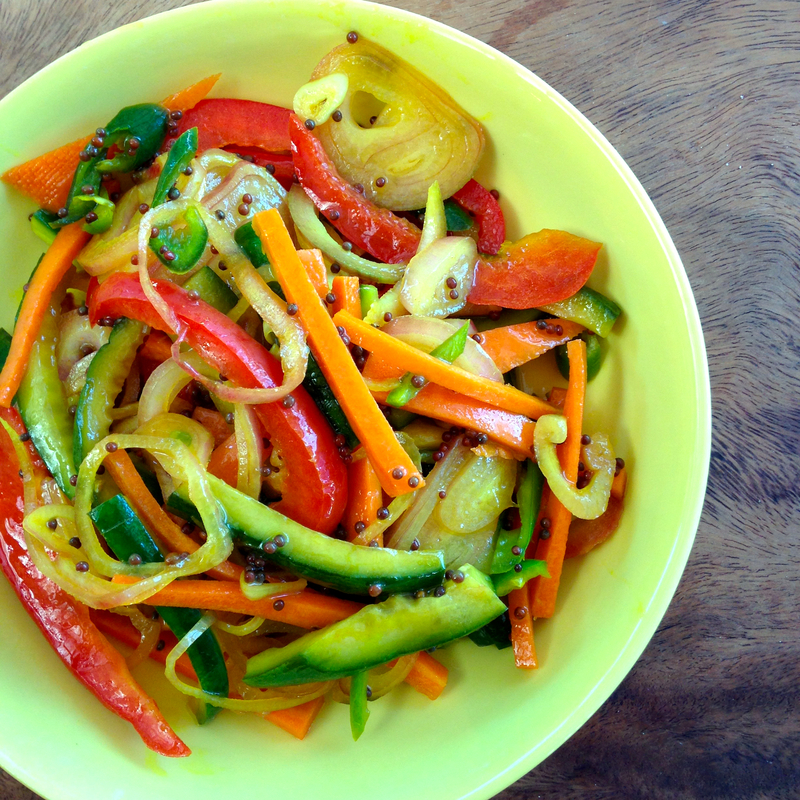 Mix well and let vegetables rest in marinade for at least an hour before serving. Yummmm this looks perfect to just have on deck & ready for the perfect dish!